An original letter of correspondence between brothers and business partners Joshua Coffin Chase and Sydney Octavius Chase. Topics discussed in the letter include a new tract of land in the northeastern section of Isleworth Grove, Joshua's suggestion to grove King oranges of the S. M. Stephens strain, and the Isleworth strain of pineapple oranges. 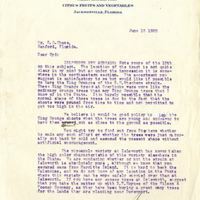 Original letter from Joshua Coffin Chase to Sydney Octavius Chase, June 18, 1920: box 49, folder 20.84, Chase Collection (MS 14), Special and Area Studies Collections, George A. Smathers Libraries, University of Florida, Gainesville, Florida. Digital reproduction of original letter from Joshua Coffin Chase to Sydney Octavius Chase, June 18, 1920. ISLEWORTH NEW ACREAGE: Note yours of the 18th on this subject. The location of the tract is not quite clear in my mind but am under the impression it is somewhere in the northeastern section. The assortment you suggest is satisfactory to me but would like if possible to have the King Oranges of the S.M.Stephens strain. These King Orange trees at Greylocks were more like the ordinary orange trees than any King Orange trees that I know of in the State. It is barely possible that the normal shape of these trees is due in the fact that the shoots were pruned from time to time and not permitted to get too high in the air. We believe it would be good policy to iop[?] the King Orange shoots when the trees are young and endeavor to have them sprout out as close to the ground as possible. You might try to find out from Stephens whether he made any such effort or whether the trees were just naturally cut back by cold and assumed the present shape without artificial encouragement. The pineapple variety at Isleworth has never taken the high color characteristic of this variety elsewhere in the State. We are wondering whether or not the strain at Isleworth is absolutely pure, although we know that you secured same from Merritts Island. It is hard to beat the Valencias, and we do not know of any location in the State where this variety can be more safely carried over than at Isleworth. If you have any excess trees at Isleworth, suggest that you take the matter up with B.W. Haynes of the Wilson & Toomer Company, as they have been buying a great many trees for the lands they are planting near Davenport. Chase, Joshua Coffin. 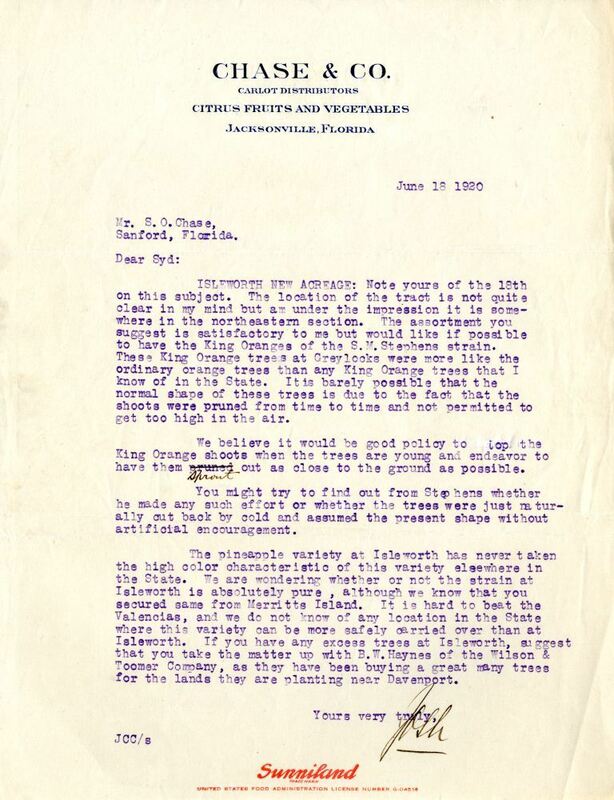 “Letter from Joshua Coffin Chase to Sydney Octavius Chase (June 18, 1920).” RICHES of Central Florida accessed April 21, 2019, https://richesmi.cah.ucf.edu/omeka/items/show/2724.